Normally, there is a certain energy surrounding a band during that crucial first week following the release of a new album. Often times, it can feel like a fresh start or an exciting new beginning. It is often the best moment to catch a band live. They're refreshed and ready to start rocking people again. 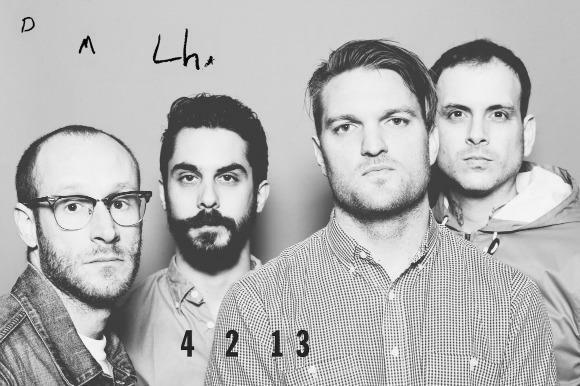 For Cold War Kids, the energy is a little different. Perhaps it is because they have been around this block a few times now. It's not that Cold War Kids don't feel buzzed off the release of Dear Miss Lonelyhearts, they clearly are. But that doesn't stop them from carrying themselves with an air of indifferent poise. In terms of indie rock, they are seasoned veterans with four albums under their belts, and it shows. Before their concert at Webster Hall on Saturday, I got a chance to catch up with lead singer Nathan Willett and bassist Matt Maust on the process of making of the new album, and how their gripping new single, "Miracle Mile", was a fateful, last-minute addition. I know you have taken up the task of designing the album covers yourself, I was wondering if you had a background in graphic design? Matt Maust: Yeah, I went to college for it and picked it up along the way. For the new album, what themes were you trying to express on this particular cover, and how did that come through in the composition? MM: I've always been obsessed with Vogue covers, so I used a font that was really similar. They're both Bodoni and I wanted to do something that had a high gloss feel to it. I've always been obsessed with New Order covers as well, I don't know if you've seen those. I wanted something that was very inspired and quickly done. So if you look at the inside artwork, it's all stuff that's very quickly done, but pined over for a long time and put together in a layered way. I wanted something almost feminine, and I like it a lot. Dear Miss Lonelyhearts is a concept album, how did writing for a specific narrative change the way you thought about an album as a whole? Nathan Willett: Well, I don't really want to call it a concept album. When I think concept album, I think The Wall or Johnny Cash riding the rails or whatever...Magical Mystery Tour... I don't think it's tightly wound around this story any more than Robbers and Cowards. I think it's something that kind of knits all the songs together, which could be called a concept. So, I don't know! I just read that book and I liked it a lot. [There was] something in it, the book being from the 1930s and being a little obscure and very weird; a little religious. It seemed like it came from such a weird time. It also reminded me of some of my favorite writers. It had a lot of Dostoyevsky references in it and it felt very J.D Salinger at times. There were a lot of reasons that I really connected with it. You had kind of experimented with narrative and concept on Robbers and Cowards, as you alluded to. I was wondering how you brought in that and expanded those boundaries on this record. NW: You want to accomplish two things: a setting and a context. I think there's a lot of that on Robbers and Cowards. There's a lot of a place - this is what's happening, these are the people who are there, and those kinds of details. And then over here, in a song, all those things that you ultimately set up are there so you can accomplish something that says 'I want you.' It's something that has nothing to do with those details. So, I think that this album has less of the details, more of the 'I want you' and that's why I think the idea of calling the record Dear Miss Lonelyhearts. The artwork in it holds the details, and the lyrics are less specific. Throughout the show, Cold War Kids played plenty of material from their first and second albums. The crowd goes wild (obviously) during "Hang Me Up to Dry". During set list opener "Saint John", I start paying more attention to the details that Nathan had alluded to earlier. He's right of course. Much of the band's early material has an incredible amount of setting where their characters can interact with one another. People react to the new material in a much more organic way, and I'm now wondering if this was intentional. What was it about the novel, Miss Lonelyhearts that appealed to you guys. Did it raise the stakes in terms of trying to do another work of art justice? NW: Maybe a little bit. Yeah, I guess most of the things I said already apply to that. Do you see the two in conversation with one another? NW: Well, I don't necessarily think it's the kind of thing where it's not meant to make you go out, read the book and make all these connections. It's gotta look good on its own and hopefully it does. Matt, during the live show, the guys at our office were wondering after seeing you down at Hype Hotel, what's the deal with the touching? MM: What's the deal with it? I don't know. NW: Primal! It's just primal, instinctual! MM: Yeah, the first kind of music we listened to when we were kids, was punk and I still listen to it a lot. All those bands, touched a lot. At least they did in the photos. I didn't live through the 70s and the early 80s, so I don't know. I think that it shows an intimate side of our band and an intimacy that we have with each other and I think it goes a long way. It's not forced or contrived in any way with us, we're all friends. Maybe we don't hug enough in real life so we do it on stage. It's natural and it just comes out. When you don't know what to do, you laugh or cry or hug somebody. An hour and half show is a long time, you gotta make some contact. I like to touch people in the crowd, too. Not in a weird way... It's great. I don't know if I made him a little self-conscious about this, but during the show, Matt didn't seem as interested in touching his bandmates. Still, While Nathan is playing the piano, Matt firmly places his head against Nathan's spine and nobody seems to mind. What was the first song you wrote for this album and how did it set a precedent for the rest of the material you composed for it? MM: I think "Jailbirds" is the first song we recorded. NW: Sounds good to me... I do not remember. MM: What was the second part of that question again? How did it set a precedent for the rest of the material? NW: There became two types of songs. There became the more instinctual ones, like that one, "Jailbirds". Then there are those that changed later - that we went for a more electro feel with - I'm not sure how that affected everything. In terms of the live show, are there any songs from this record that you feel are better for that setting, for getting a crowd into it? MM: "Loner Phase" is really bumping. NW: "Loner Phase" has been a really fun new one. MM: "Tuxedos" is really fun to play live too. They didn't play "Tuxedos" in New York. The crowd at Webster Hall was, however, treated to "Loner Phase", and Matt was right, it did bump pretty hard. During the song, a blonde was inspired to jump the barricade gaining access to the stage. Matt came over and told her to get down, which she interpreted as, "Don't get down." Needless to say, she was quickly escorted off by management. "Miracle Mile" is a tremendous single. Can you break down how it came together? NW: We thought we were done with the record, we went to record these four cover songs that we released. In that time we were fooling around with some other things and that song and "Tuxedos" both happened during this time. We knew we wanted to put them both on the record. "Miracle Mile" seemed like a perfect kind of something that is very much Cold War Kids. In a way that is very past and present. It seemed like it would be a great single. MM: Our friend Richard Swift, who is a musician as well, came down and hung out with us for the week. It just came out of nowhere. When you were writing it, did you have a sense that the song was going to end up becoming as big as it did in the final product? MM: We knew that we liked it. We try not to think too much about it. We knew it was a rockin' tune. It becomes more than it becomes, I think it's still becoming. We shook hands once more, and I was escorted out of the room by their manager. As I stood up on the balcony of Webster Hall, I thought about what the band had just told me. They seemed like a group who were refining their process, coming to an understanding about what works and what doesn't along the way. Hit singles can come out of nowhere. Nathan Willett does not want people to pigeonhole his album as a concept. But what does it all mean for the fans? As one girl remarked to her friend on the way out, "It was a great show, until they didn't play..." This seems to be a reoccurring issue for bands like Cold War Kids. But I'm confident that Dear Miss Lonelyhearts will act as this band's catalyst. It's an album of growth and successful experimentation; one that will invite fans to take a step back to explore and enjoy their catalog as a whole. After the encore, Nathan put his guitar down, waved to the audience and remarked, "see y'all next time." I get the sense that he was probably right. Dear Miss Lonelyhearts is out now.